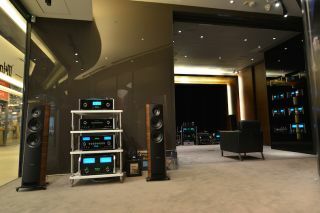 McIntosh opens luxury Hong Kong store | What Hi-Fi? The new store is called Hi Fi Gallery and features all manner of premium McIntosh electronics teamed up with Sonus Faber speakers. The kit on show includes the D100 DAC/pre-amp and MXA70 stereo system and even the 1200W, MC1.2KW power amplifiers - a snip at £12,495 each. Needless to say the demonstration rooms look out of this world. They're packed with extravagant systems basking in the glow of McIntosh's trademark blue VU meters. There are four dedicated demo rooms, two home cinema and two hi-fi, with one of each specially treated to give customers the best listening experience before they buy.